I have always found hard to imagine how concepts and ideas we are now accustomed to, once were not part of everyone’s life. Some of those thoughts appear to me so central and grounding, that I believe their fall would imply the collapse of most of our everyday credo, and a world were they are absent would need to be built with totally different bricks. Those thoughts are not always related to science, or not only to exact science at least. For one thing, you could think about the Earth being round — ok, this is pretty much exact science. But also, say, the importance of subconscious in everyday behaviour. The late-roman, early-christian sense of pietas and respect for the sufferings of people. The book The Copernican Revolution by T. S. Kuhn is the story of how an idea – one that today we could not even fantasize to be true, but back in the Middle Ages could not even be fantasized to be false – crumbled, and in a slow domino effect brought together with it the whole concept of the universe in its broadest sense. This idea placed a motionless Earth in the center of a huge rotating Sphere, where all stars were set, and which also sealed the (hence finite) Universe. The Sun itself lied on this Sphere, but, alone among the stars, was moving of a circular motion on the Sphere itself. The “central Earth” model mentioned above (with minor and less minor modifications) has old roots, dating back to Anaximander (6th century BC) and having its most representative spokesman in Ptolemy (2nd century AD) and his treatise Almagesto (more details on it come in the next section). During the centuries, those roots interwove with everyday physics (to be read: physics dealing with events we see every day, like rocks being thrown and objects hitting each other), with philosophy, moral, and religion. Those ideas nourished each other, condensing in a coherent, solid backbone, which lied behind educated people everyday actions, as well as reflected the meaning they gave to life and Universe. As we shall see, replacing the central Earth universe with a new one required dissembling this infrastructure, and this turned out to be a quite hard and slow process. Back to Ptolemy’s model. So, Earth is motionless and lies in the center of the Universe, while all stars are in a huge rotating Sphere, far away from the Earth, which is called Celestial Sphere. As for predicting the apparent movement of the stars, Ptolemy’s model works pretty well – it is used even nowadays for navigating without GPRS. Today we know that those stars are actually far away from each other. But since they are far away also from Earth, a rough measure (the one that was possible back then) of their behaviour seem to imply that they all rotate at the same speed. As for the Sun, it cannot be imagined as rotating together with other stars – it is too close to the Earth when compared to them. Hence Ptolemy, while still setting it on the Celestial Sphere, endowed it with an extra revolution movement, which again roughly approximates its real behavior. One immediately notes that this simple and quite elegant model completely ignores the planets, the reason being that their behaviour, even from a qualitative point of view, is way less predictable and regular than the one of the stars. For instance, an observer lying on the Earth usually sees each planet going east, but sometimes one of them happens to go west for a short period, restarting its normal motion towards east shortly afterwords (this is called the apparent retrograde motion). The motion of Mars in 2003 as seen from the Earth (image taken from Wikipedia). Hence, early astronomers were challenged with finding a model that could be used to predict the behaviour of the planets. The Celestial Sphere being widely accepted as truthful, most systems tried to settle this open issue by inserting the planets in orbits around the Earth somewhere between the Earth itself and the external Sphere. They all deviated from the tradition as little as possible, and mostly designed for the planets trajectories obtained as the composition of circles. One example is the following: draw a circular orbit O1 around the Earth. Now fix a point P on this orbit, and draw another circular orbit O2 around P, and put your planet, say Mars, somewhere on O2. Now let P move around O1, O2 move together with P, and Mars orbit on O2. For suitable rotational speeds of O1 and O2, an observer from the Earth will see Mars mostly going in one direction, and from time to time proceeding backwards, hence experiencing the apparent retrograde motion (O1 is called deferent, while O2 is known as epycicle – see the picture below). Hence such a model can, at least qualitatively, predict the behaviour of a planet. For obtaining accurate quantitative predictions, one needs to complicate things a little bit – adding orbits O3, O4, etc. centered on points of O2, O3, etc., and using other tricks. Ptolemy was not the first to introduce such observations, but was the first that embedded them in a coherent framework, which provided much more accurate predictions than any other system before. As, however, this theory can be shown false by solid reasons, it cannot be held to be the sense of Holy Scripture. It should rather be considered that Moses was speaking to ignorant people, and that out of condescension to their weakness he put before them only such things as are apparent to sense. Now even the most uneducated can perceive by their senses that earth and water are corporeal, whereas it is not evident to all that air also is corporeal. […] Moses, then, while he expressly mentions water and earth, makes no express mention of air by name, to avoid setting something beyond their knowledge. With modifications and “reinterpretations” like the one above, a rather coherent and self-contained cosmology was achieved. I will not even try to give details on how this complex interplay of science, moral, religion, and everyday experience realized. Instead, I will sketch a simplifying example, which I hope makes the point: humans are God’s beloved creation, and Earth was created for humans. That is why Earth is in the center of the universe, and that is why it is round, for round is the most perfect of shapes, and God is perfect. For symmetric reasons, every object is attracted to the center, hence a stone that I drop will fall towards the ground, since it is attracted to the center of the Earth, which is at the same time the center of the universe. God lives in the heavens, which are above us, hence the skies are made of a divine material, which is incorruptible, while things on Earth get old and tear apart, for we are sons of God but also sinners. That is why you and I grow old and die, while the Sun will keep appearing at the same, predictable time, in the same place, with the same shape. The years of decadence that followed the collapse of the Roman Empire dissipated most European knowledge, including the one on the works by Ptolemy and Aristotle. Together with others, those were to be slowly rediscovered in the XXII centuries, and immediately became an essential reading for any scientist of the period (even though the concept of scientist is much more recent — a term that better suits the period is natural philosopher). After a while, scholars became unsatisfied with the accuracy of its predictions and some theoretical incongruences of the model, and proposed minor modifications here and there to present better systems, with a serious general improvement nor of the model, neither of its accuracy. For a long time, no serious scholar made a real attempt to questionize the fundamentals of this universe – the central Earth. Let us present the main reasons for this. First, the authority that Aristotle and Ptolemy had among the scholars was incommensurable. Ipse dixit (“He himself said so”) was a common way to back up an opinion by claiming that Aristotle himself expressed that idea. Centuries of decadence in science made scholars think of greek wisdom as a limitless source of knowledge, and they hardly dare to question the very base of their arguments. For a second reason, let us consider again the example at the end of the previous section. The cosmology that lies behind it is kept together by a tense equilibrium. If you remove one piece, then all the building starts trembling and may fall down. If Earth is not the center of the universe, does it mean that humans are by no means special to God ? And moreover, why do stones keep falling towards the ground ? A model willing to replace the Ptolemaic was confronted with many questions like those. This was clearly unfair, for the same question were answered in the Ptolemaic model after centuries of discussions, tries and errors, experiments, while a brand new system was required to have them ready altogether. Also, the equilibrium reached between the Holy Scripture and the scientific status-quo risked to be dismantled by any substantial modification of the system, and any reformer would have had the fierce opposition of the Church. So many scholars, even criticizing the work by Aristotle and Ptolemy, did not dare to take the big leap and remove the Earth from the center of the Universe. A peculiar case is that of Nicola D’Oresme, who basically state what today we know as Galilean relativity, hence showing that in principle one could not determine if the Earth was moving or the Sun, but did not turn this possibility into reality. 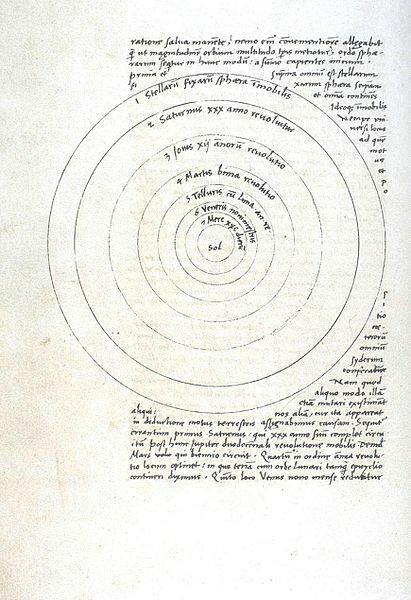 Even though he was one of the most prominent astronomers of his era, Copernicus himself waited several decades before having his manifesto The Revolunitionibus Orbium Caelestium printed in 1543. His model put a motionless Sun at the center of the universe, with all the planets, including the Earth, orbiting in circular orbits around it. He kept the other stars in a circular sphere, which again was far beyond all planets and sealed the Universe, but he now assumed the sphere to be fixed. His model also provides a number of other minor modification to the state-of-the-art system, but none as substantial as the ones just mentioned, hence I will not write more about it. Nothing reveals the nature of the Good more fully than the light [of the Sun]. First, light is the most brilliant and clearest of sensible objects. Second, […]. Fourth, the heat which accompanies it fosters and nourishes all things is the universal generator and mover […] The Sun can signify God himself to you, and who shall dare to say the Sun is false! In the middle of all sits Sun enthroned. In this most beautiful temple could we place this luminary in any better position from which he call illuminated the whole at once ? He is rightly called the Lamp, the Mind, the Ruler of the Universe; Hermes Trismegistus names him the Visible God, Sophocles’ Electra calls him the All-seeing. So the Sun sits as upon a royal throne ruling his children the planets which circle around him. 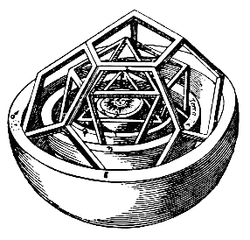 Hence, the neoplatonic philosophy allowed Copernicus to consider a universe whose center was the Sun, providing the necessary philosophical background for a new cosmology. Such motivations sound extremely awkward to our present sensibility. Nowadays people working in science, even those that study the fundamental laws of nature, do not usually aim at embedding their theories in a more general philosophical setting. There are multiple reasons for this. Let me mention two: research is very specialized, and people working in a specific area do not have the interest, let alone the competence, to define a metaphysical framework that backs up their theories or experimental results. Moreover, we are now much more humble regarding the goal of our studies. We do not aim at describing reality itself, but just a (possibly accurate) model of it. Centuries of research showed us that each theory, even the most succesful (eg Newton’s mechanics), is doomed to be replaced at some point by a more advanced one, which dealt with a wider class of phenomena, or with the same phenomena in a more accurate way. Hence, there is little reason for finding a philosophical explanation for a theory, when the one thing we know about it is that it is false! Even though most astronomers appreciated Copernicus’ work, for all the prejudices mentioned above and because Copernicus’ predictions were not much more precise than Ptolemy’s, the central Sun hypothesis was either ignored or considered to be a pure technical one, i.e. an assumption made for mathematical convenience and not representing the real behaviour of the universe. Hence, for most people working in the field, the Earth remains where the Bible and Ptolemy placed it, ie at the center of the universe. Needless to say, outside the scientific world, people hardly get to know Copernicus’ model. In the long run, this was an advantage: being not so considered, Copernicus’ idea was sheltered from the troublesome attentions of censorship. As a beginner of a revolution, Copernicus was hardly revolutionary at all. Trained as a Catholic priest, he did move the Earth from the center of the Universe, but kept unchanged almost everything else: the Universe was still finite, still was it sealed by the huge Celestial Sphere. In a really medieval fashion, he felt he needed philosophical arguments (the neoplatonic importance of the Sun) to back up his theory. As we already mentioned, his predictions were not much better than Ptolemy’s. Still many sea changes were required to transform his universe into Newton’s. a fountain of light, rich in fruitful heat, most fair, limpid, and pure to the sight, […], called king of the planets for his motion, heart of the world for his power, its eye for his beauty, and which alone we should judge worthy of the Most High God […] Who would hesitate to confer the votes of the celestial motions on him who already has been administrating all other movements and changes by the benefit of the light which is entirely in his possession ? […] By the highest right we return to the Sun, who alone appears, by virtue of his dignity and power, suited for this motive duty and worthy to become the home of God himself, not to say the first mover. He imagined that, because of this, the Sun was emanating a force called anima motrix that attracted planets towards it. When digging into some other aspects of his work that were to be soon forgotten, this neoplatonic background is even more evident: for instance, he related the size of the orbits to the platonic solids, and hence to the number of those the number of planets. After Kepler and Galileo’s work, there was no doubt that from an astronomical point of view the Copernicus’ system (or, better said, its evolved version due to Kepler) was clearly better than Ptolemy’s. Thus, the only arguments against the central Earth hypothesis could be non-astronomical. Most of them regarded the coherence of the Universe, posing question similar to the ones mentioned in the previous section. The physics and the moral that were appropriate for Ptolemy’s universe were clearly unsatisfactory for the new one, and no one had good substitutes for those. Little by little, these questions were to be answered coherently with the new system. Contributions to this started with Kepler and Galileo, proceeded with Descartes and Hooke, and have their main representative in Newton. I will just focus on the work of the latter, as his answers are the most definitive and relevant. I explained so far the phenomena happening in the sky and in the sea via gravity, but I never explained the cause of gravity. For this force arises uniquely from some cause, that penetrates till the center of the Sun and of planets […] His action extends everywhere till endless distances […] Actually, I was not able to deduce the grounds of those properties from phenomena yet, and I feign no hypothesis (“Hypothesis non fingo”). Any assumption that cannot be deduced from phenomena is to be called “hypothesis”; and in experimental philosophy there is no place for hypothesis, whether metaphysical, or physical, or on occult features, or mechanic. In this philosophy propositions must be deduced from phenomena, and made general by induction. […] It is sufficient that gravity exists de facto, and behaves according to the rules we exposed, and explained the movements of celestial bodies and of our sea. Newton’s contribution brought the new universe to a higher level of self-coherence and conformity with natural phenomena than Ptolemy’s had ever been. Not only his results, but his very approach was an example for all scientists to come, who were to discover other fundamental laws that provided explanation for more and more events (this is a super-interesting topic, but definitively out of the scope of this post). Even the relativistic and quantum mechanics, that were to replace Newton’s in the XXth century, can be seen as a product of the more modern concept of science that Copernicus’ universe produced. Kuhn wrote The Copernican Revolution starting from some material he produced for a course on history of Science at Harvard. Those lectures were intended for students in humanities with a general interest in science. This is clearly reflected by the style of the book: no assumption on the reader’s previous knowledge is made, every new concept is defined and explained, often with examples. Kuhn gently guides you through the technical parts of Copernicus and Ptolemy’s work (though he does not provide full details), and confines some more difficult parts to a technical appendix. Hence the book is really enjoyable whatever is your background. His elegant prose is coupled with a very scientific approach to the matter: his reasoning never lacks in coherence or asks the reader for a leap of faith. Not only it provides you with brilliant ideas and concepts, but the way you are introduced to those is very stimulating: if you dedicate to this book the time it deserves, you’ll be rewarded with tons of nice intuitions and a modified attitude towards science, whether you previously were into it or not. I would say that this book is even more enjoyable if you’re not into science, hence you’re not used to look at it as an integrating part of your life and society. This book can be also interpreted as a prequel to Kuhn’s manifesto The structure of Scientific Revolutions, where he exposes his general theory on how science evolves (about which I will write some other time). In the short summary I gave of The Copernican Revolution, I did not mention the general observations Kuhn makes starting from the “case study” given by the Copernican Revolution. Though they are many, witty, and point the reader’s attention towards Change in Science, in particular how difficult thinking out of the box is. Even scientist that produced a new idea, often were too much soaked in the status quo to realize what the furthest consequences of their innovation could have been. I believe this is a lesson of incommensurable value for everyone working (not only) in science. This entry was posted in Uncategorized and tagged Books, History/Philosophy of Science, Science, Universe by yfaenza. Bookmark the permalink. GOOD TO KNOW WHAT THE WORLD BELIEVES IN…..